Travel with Kevin and Ruth! : How to Ride an Ostrich! Yesterday was totally hilarious, and we have the video below to prove it. Never thought we would ever hold an ostrich in our hands, let alone ride one! What an experience. Too funny. 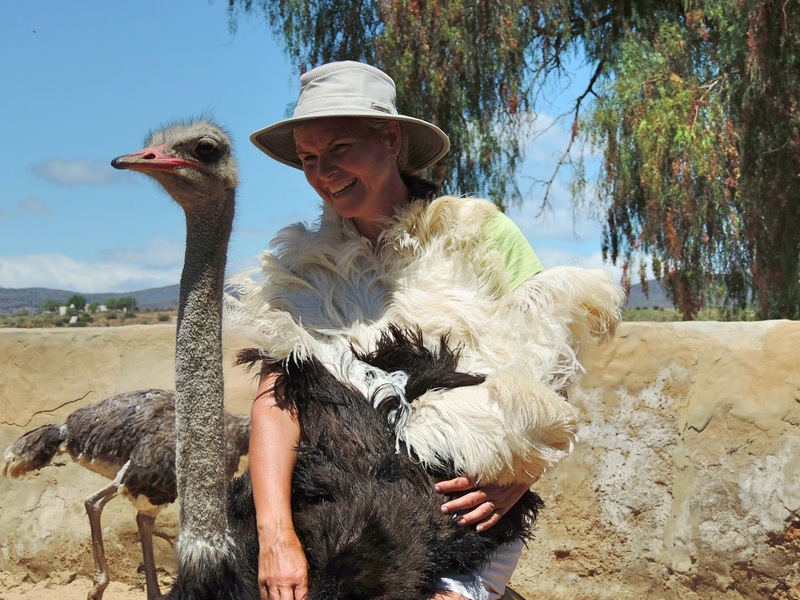 We were invited to visit the Highgate Ostrich Show Farm near Oudtshoorn, South Africa. 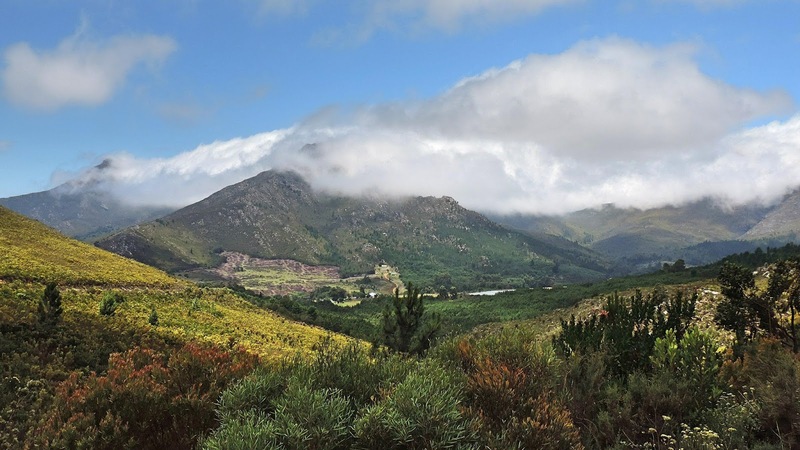 The farm is located only an hour's drive off the popular "Garden Route", and it's definitely worth the detour. Beautiful scenery near Robinson Pass. We arrived a few minutes before our 10:00am reservation. This is a great time of year to visit because the busy crowds from Christmas and school holidays are over. We were greeted by our tour guide Melissa, who would spend the next two hours telling us everything she knows about ostriches. And Melissa knows a lot about ostriches! First stop was to see the little ones! These ones are only five days old. Most of the eggs are artificially incubated to increase the number that hatch, although they do have an area where some birds do the job naturally. Interesting how their neck is actually quite short at this age. Next stop was the small workshop where artists and craftsmen produce the many tourist trinkets that are made from various ostrich parts. Feather dusters and decorated ostrich eggs are very popular! We were visiting on a Sunday, so most of the workers had a day off. However, we were fortunate that professional feather duster maker, Uncle Melvin, was on hand to show us his stuff. Melvin uses an old, but very effect machine to make up to 300 feather dusters per day! Ruth is demonstrating how to use a feather duster. But these feather dusters are made so that both sexes can use them. They're not just made for women! Another room is where the ostrich eggs are decorated and painted. Next, we went to see some of the full grown birds. An ostrich is considered full grown at 18 months, and an adult ostrich will live to between 45 and 60 years! 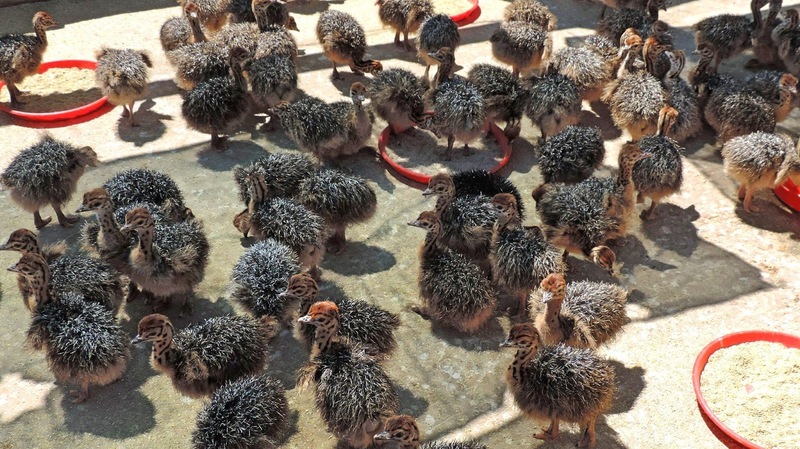 However, most ostriches are culled for their meat and leather at 18 months. When an ostrich is kept for it's feathers, it is not killed. They used to kill them for the feathers, but then it was found that if the feathers are properly trimmed, they will grow back. Ostriches are so funny looking. But they're even funnier when you try to feed them. Melissa went to get a bucket of dried corn. They love the corn, and you could see them getting excited as they definitely knew what was coming! 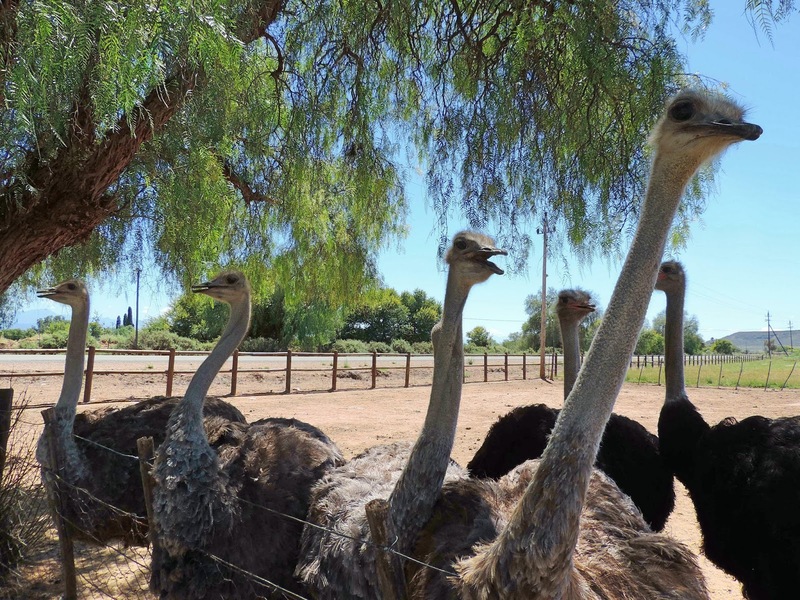 Ostriches waiting for their corn. Ha! I had the bucket of corn and all of the ostriches wanted some. They were pecking at the bucket so fast I couldn't see what was going on. There was corn flying everywhere! From there, Melissa took us over to the area where the ostriches mate and hatch the eggs naturally. There is usually only one mating pair in a large fenced area, although sometimes there are two females with one male until he decided which one he wants! Sometimes, he wants more than one, although they are usually monogamous. This is a big male ostrich, Jack the Ripper! And this is his wife Susie. Susie is on top of her 7 eggs, but eventually she got up. Ostrich eggs are very strong. Melissa says that she has allowed some very large male tourists to stand on the eggs and she hasn't seen one damaged yet! Our guide Melissa, showing how they cut and trim the feathers. Before you can ride an ostrich, you have to learn how to sit on one. So they capture an ostrich and place a bag over it's head. This doesn't hurt the ostrich at all, but it becomes very calm and you can easily manage it. Ostriches can be aggressive, and their legs are very strong. In fact, there have been reports in the wild that an ostrich can kill an attacking lion with one hard kick. They are also the fastest creature on two legs and can reach speeds up to 70 km/h (43 mph). Ruth, carefully mounting the ostrich. The wing feathers fold up and look very pretty! I also sat on one, but the feathers didn't look nearly as pretty on me! It was then time to ride an ostrich. If nothing else, you have to watch this video. It's hilarious. Turn up your volume first so that you can hear Ruth shrieking! Ha, ha, ha. Yep, and then it was my turn. And yes, you have to hang on for dear life! Kevin, riding an ostrich. Do I look like I was falling off? Well almost. But I hung in there for the entire ride! Then, we got to watch the professionals. These three guys really knew how to handle an ostrich. They could make them run and steer them. It was exciting watching them race! Then it was off to the curio shop where you can purchase any ostrich related products. Melissa, explaining about the ostrich skeleton, and showing us some of the items they have found in ostrich stomachs! Various things that the ostriches have eaten. And of course after you have learned about the ostriches, held the ostriches, sat on and ridden the ostriches, and seen the products made from ostriches...you have to taste the ostriches! They have a great little restaurant onsite at the Highgate Ostrich Show Farm. The outdoor seating at the restaurant. The first item we tried was ostrich egg fritatta with ostrich biltong. The biltong is a dried meat similar to beef jerkey. Delicious! I expect the egg taste to be stronger, but it was much like chicken egg. Go easy though because ostrich egg is very rich and extremely high in cholesterol. One single ostrich egg contains as much food as two dozen chicken eggs! Next up, ostrich steak. Again, perfectly prepared! low in fat, and high in protein. And tasty and tender too! 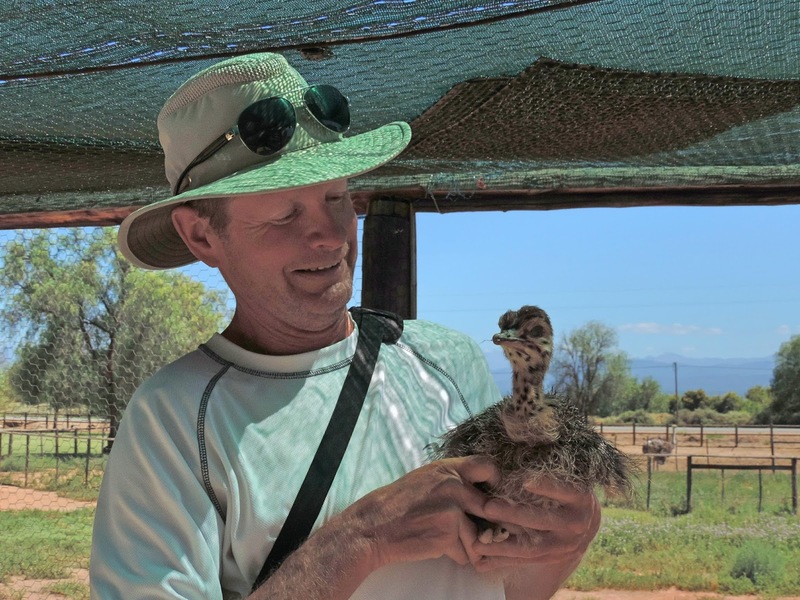 We thoroughly enjoyed our ostrich tour at Highgate Ostrich Show Farm! We laughed a lot at these interesting creatures and their antics. And our guide Melissa was simply the best. 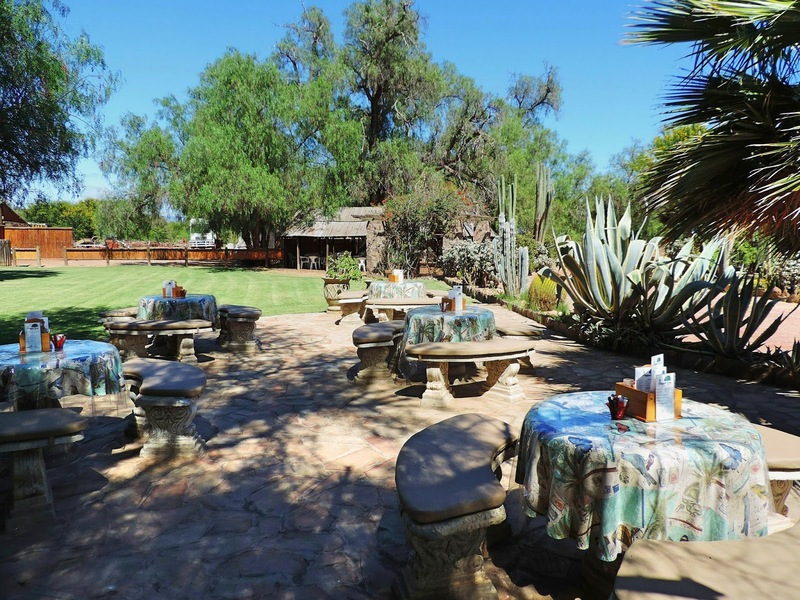 These tours are priced between R110 ($11.50) for a traditional tour and R285 ($30.00) with a full dinner. We can honestly say that you will have fun, and we highly recommend you put a visit here on your list! 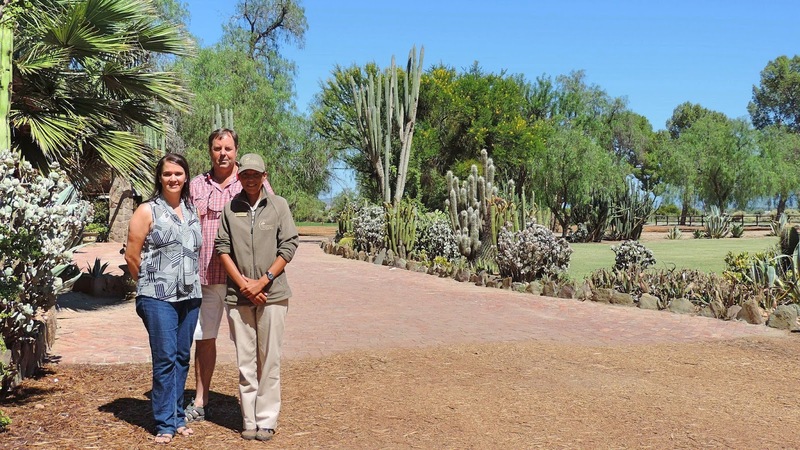 Assistant Manager Nelli, Manager Jan, and our tour guide Melissa in front of the gorgeous grounds at Highgate Ostrich Show Farm. What a fun adventure. I think Ruth could have a new profession! The strength of the eggshells is amazing - wonder what makes them so strong - and how does one crack an egg when wanting breakfast? The eggs are very think so this is what makes them strong. Normally you wouldn't crack an ostrich egg as the eggshell itself is of value. You would blow out the contents just like you would when decorating Easter eggs except that you would need to "chisel" a small hole at one end then insert something inside to mix up the white and yolk and then drain/blow out the contents. What a hoot! Unfortunately the video only shows black on my computer for some reason so can't watch it but looks like you had fun. You should be able to watch it the same way you would watch any other youtube video, if not then look at Bob's comment for other suggestions. BTW, it was fun even if I was screaming! The ride that Ruth had was very funny. Looks like you enjoyed the whole day there and had some great food as well. We had a fantastic day filled with lots of laughs! Wow. I'm thinking thought that maybe Ruth should stick to bungee jumping? I don't think there was as much screaming that time. Fun stuff. Oh, and for Sandra, it probably comes up as a "MOV" file. Save it and then open it in Windows Media Player, or better yet, download DIVX and set it as your default. You won't have any more problems. You're welcome. No thanks Bob, I would rather ride the ostrich again. The only reason there wasn't as much screaming with the bungee jumping is that it was over much faster. If you listen closely to this video you can hear me laughing in between the screams! Thanks for helping out Sandra with some suggestions for watching the video. Don't think I would want to feed the Great White shark but feeding the ostriches was almost death defying! Oh my gosh!!!! What a hoot you two are!!!! Ohhh, and the taste so good! And, it really was great fun. OMG - that was crazy fun - we are still laughing!!!!! So glad that you both enjoyed it! Very funny:) I thought the answer how to ride one was very carefully! Having now done it, I would say that you hold on for dear life! Colin says that you are having the time of your life. Thee was an ostrich at the RV park in Acapulco but we only got to feed it, not as much fun as you had. We did get one the eggs as a gift that hand been painted with our RV, dogs and us. Yes, we are having the time of our lives! 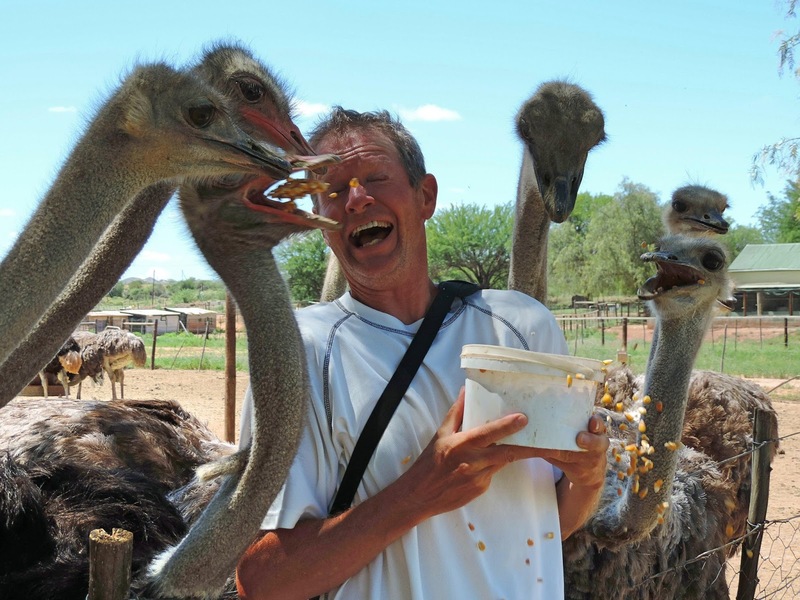 Feeding the ostriches was a task in itself, I thought I was going to lose a finger, lol! Do you still have the egg? That would definitely be a nice keepsake. Ostrich is such a nice lean meat. I too ate it after a ride. Seemed like I was on it forever but I"m sure it was only seconds before I started to slip off so jumped. My ride was at Cango Farm. Love the video. Am headed for Kruger tomorrow. Keep on enjoying this marvelous country. Sounds much like us, we had a ball! Hope you are having or had a great time a Kruger, which we are sure you did! Where are you headed after Kruger? What a ride! I must go and find me ostrich meat for the Weber Q. Hope you can find some, and if you do make sure not to over cook it! What a fascinating tour. I have learnt a lot from your post! Your rides looked somewhat uncomfortable and crazy. Glad you had a fun time! You are right, it wasn't the most comfy ride but it sure was a crazy one! Riding an ostrich,this time you realy gave us a thrill.cheers. And, it felt like one too! Boy the adventures you two cook up. Wonder what the ostriches think of all this? I wondered what they thought of it as well! It's hard to tell whether mind it or not but it certainly doesn't seem to harm them in anyway. You really go on quite the adventures. Have thoroughly enjoyed all of them. Really laughed when I saw the picture of Kevin feeding the Ostriches. Following your blog is so interesting. Really hope you do get to Australia, we will get to see parts of the country that we haven't seen and never will because of the different modes of travel. We travelled some by train but still not the same as camping. Can't wait for you next adventure. Thank you so much Diane, we are really having such a great time and enjoy sharing our travels and adventures with everyone. We would love to go to Australia and if we did we would certainly be doing it in some type of RV or camping kind of vehicle and just taking our time and enjoying every minute of it. So why no video of Kevin riding and ostrich ???? It seems to be working fine, try refreshing the page and then try again.